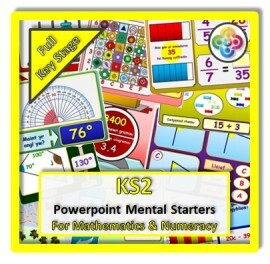 Develop mastery of Mathematics topics with this fantstic product, in Welsh. This contains 275 Powerpoints, translated into Welsh by staff in a Welsh Primary School. There's at least one Powerpoint Mental Starter for every statement on the Key Stage 2 Maths National Curriculum for England. (65 for Year 3, 65 for Year 4, 75 for Year 5 and 70 for Year 6). 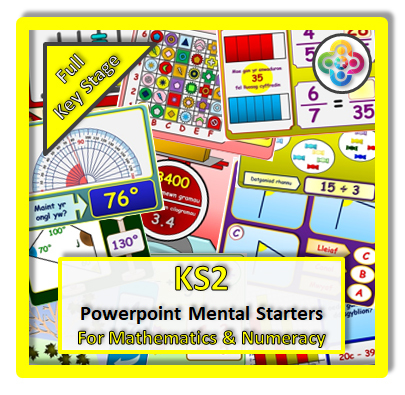 Your download contains all the powerpoint presentations, a spreadsheet showing the links to the maths national curriculum for England, plus a screenshot of each powerpoint, so you can see at a glance what they look like. Screenshots for all the powerpoints for this product can be seen on the product pages for individual year groups on this website, and there is a one sample from each year group on the samples page (Link at bottom of website). The samples are currently from the English versions.